Alvin Kamara, on the other hand, was a late round speculation draft pick, at best. Coming into the season, Adrian Peterson and Mark Ingram were going to split the workload in one way or another. Kamara, who was impressive since training camp, finally forced the Saint’s hand and they traded Adrian Peterson after Peterson failed to provide much. The rest is history, and Alvin Kamara finished as the #4 overall player in fantasy football. We’ve talked again and again on the podcast about how special this rookie class of running backs can be. There are also a couple of wide receivers that deserve as we move closer to the fantasy draft season in a few months. There are also sleepers and dynasty picks to talk about as well. You could say that this is my wrap up on the players that we haven’t seen play an NFL down as we transition into profiles of players who have played in the coming weeks. Saquon Barkley – Obviously, right? I have moved Barkley up in my top 100 all the way to #13. I mentioned in that article 1,500 all purpose yards is a good guess for his rookie season, health pending. 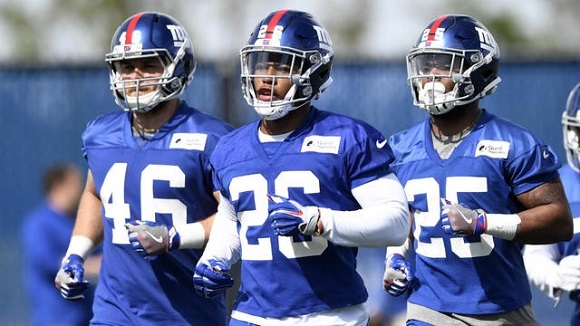 The Giant’s offense should move the ball better than it did last year with the return of Odell Beckham Jr. and Sterling Shephard gaining more and more experience. This offensive line could go from a liability to a strength if things go right. The addition of solid contributors Patrick Omameh and Nate Solder will certainly help. If Will Hernandez can develop quickly, that will help Barkley as well. It doesn’t hurt that Eli Manning should target him a lot in the passing game as well. Ronald Jones II – Early reports indicate that Jones will split the backfield with Peyton Barber going into training camp. I expect the talented rookie to pull away and get the starting job with relative ease although I do expect Barber to be involved as well. Jones has drawn a lot of comparisons to Chris Johnson. A speedy demon running back with a smaller frame. I watched his highlight tape in April and I was thoroughly impressed with his breakaway speed. I think he is going to be special. I have him as my #36 overall player in my top 100. Christian Kirk – Besides Larry Fitzgerald and David Johnson, who is Sam Bradford or Josh Rosen going to throw to? Christian Kirk may be better than his NFL draft position suggests. Kirk lined up in the slot a lot in college, but is a player who wants to be an outside receiver as well. The quarterback play is going to be an improvement from Carson Palmer whether Sam Bradford is healthy all season or Josh Rosen takes over at some point. Matt Harmon had high praise for Kirk and I’m not going to argue. It’s all about opportunity and volume in fantasy football. Derrius Guice – Derrius Guice fell in the draft because of rumors of character issues. He found the perfect landing spot despite going later than planned. Jay Gruden envisions Guice as a first and second down back while Chris Thompson handles the third down back duties. I think that they are the perfect 1-2 punch for the Skins who have struggled for a while to find a good run game. Guice’s ADP is going to depend heavily on reports out of training camp but a think that a good guess going into training camp is probably 5th or 6th round. His value could sky rocket from there based on the preseason. Royce Freeman – I think that Royce Freeman is a talented back who had a great career at Oregon. However, I’m weary to invest in him this season in fantasy football. The Broncos offensive line was pretty terrible last season and Devontae Booker will likely compete for carries again this season. Last year was very frustrating for C.J. Anderson owners. He seemed like he was playing a lot better than the results and a lot of that can be attributed to a light workload. It’s the situation and not the player. Rashaad Penny – The Seahawks shocked everybody by taking a running back in the first round of the NFL Draft. This isn’t a knock against the player at all, because Penny was one of the best running backs in the country during his senior season at San Diego State, but Seattle’s offensive line is really bad. Seattle has continuously tried to fix the problem but seem to whiff every time. Success is certainly possible for Penny with a bad offensive line. He is a big and fast back who can catch the ball out of the backfield, but I am not convinced at this point in time. Baker Mayfield – Many scoffed at the Baker Mayfield pick by the Cleveland Browns as the #1 overall pick in the draft. A lot of draft analysts view Sam Darnold as the safest quarterback pick out of the bunch. I view Baker Mayfield as an elite play maker with all of the good characteristics that Johnny Manziel brought to the table without a lot of the bad. Just look at how well he played last year at Oklahoma. Cleveland is continuing to load up on young talent and by September 2019, when Mayfield is expected to be starting for the Browns, his supporting cast could be pretty solid. Hue Jackson has repeatedly said that Tyrod Taylor is the starting quarterback for the 2018 season, but we will have to see if he sticks to his word. There are four potentially talented wide receivers in Cleveland (if you count Jarvis Landry) to go along with an above average offensive line and Mayfield wouldn’t be the first successful quarterback who is barely six feet tall. Lamar Jackson – Joe Flacco’s days are probably numbered in Baltimore. Baltimore wouldn’t have traded back into the first round if they didn’t want an extra year of control on Jackson’s rookie contract. The Ravens can get out of Flacco’s contract after this season. Lamar Jackson, just like Baker Mayfield, is an elite play maker who knows how to play the game of football better than most. Jackson is not only fast, but has a good accurate arm and is a great decision maker. Antonio Callaway – It’s no secret that the Browns are fed up with Corey Coleman and he might even be on the trading block. If you weren’t aware, the Brown’s fourth-round pick is a very talented wide receiver who didn’t play last year with the Florida Gators after getting into off the field trouble. If Callaway can keep his nose clean, and find his way onto the field, there could be some real production there. He’s definitely somebody to keep an eye on. Courtland Sutton – The wide receiving corps in Denver is getting a little long in the tooth. A lot of this can be attributed to quarterback play, but the desired production wasn’t there for Emmanuel Sanders as his only brought in two touchdowns in 11 games last season. Demaryous Thomas also had his first season in 5 years without cracking 1,000 yards. If the Broncos choose not to bring back Sanders, Thomas, or both in 2019, Sutton has the catching radius and red zone ability to contribute nicely in his second pro season. If history has shown us anything, it’s that rookies have a hard time living up to the lofty fantasy expeditions in year one. That being said, if the opportunity/volume (that is king in the fantasy world) is available then you have caught my eye. At running back we have the apple of everybodies eye (Rashaad Penny). It has to be noted (and you already hit on this) the offensive line 😱🤦‍♂️. Even with that, I can’t stop but be excited about the opportunity/volume that is available for him. You pair that with his skill set and his floor appears to be a good quality RB2 with upside for so much more in PPR formats. In Carolina we have DJ Moore stepping into a situation of high volume too. Going back to 2014 (not including 2015), we see that Kelvin Benjamin as the WR1 saw 145 and 118 targets. Then last year as the WR1, Devin Funchess got 111 targets (It would have been more but Benjamin traded during the season). I think it’s clear that Moore>Funchess. That would then appear to lead a clear path to at least 111 targets and that would appear to be the floor. The last player is a tight end, I know that’s the scariest of all rookie positions. His name is Mike Gesicki for the Miami Dolphins. The Dolphins traded Jarvis Landry (no less then 131 targets in past three years and over 161 or more in two of those. Now look at the other options for those opened targets, DaVante Paker, Kenny Stills, Albert Wilson, Danny Amendola🤔 Again it’s the opportunity for volume that has me really intrigued at this poInt. Sorry for rambling on here in the comment section, lol. My only real reason for not including D.J. Is his inability to creat separation in college. I love DJ Moore and the situation, it could be a great thing. He’s one of the two rookie WRs is feel comfortable with drafting this year. I’m much less weary of Penny than Freeman from a talent and volume standpoint. I just can’t get past the disaster of an O line. So I like the gesicki sentiment. Hell of a combine and great pass catching TE prospect. Our new guy is writing about Albert Wilson for tomorrow or Wednesday and I wouldn’t sleep on him or Stills this upcoming season (especially Stills in my opinion). @MB: You can’t blame people for burning any bridge that can lead then towards drafting DeVante Parker. Lol I actually am somebody who is intrigued with his prospects as the Dolphins WR1. He saw seven or more targets in nine of his 13 games last year. He put up a line of 5.5 catches, 65.3 yards and only one touchdown (total). That is almost 13 PPR points per game, which is around WR16. Like I stated earlier, Landry is no longer is the picture. You add that his current ADP is around 100 (PPR) and that makes for some really exciting value. Oh nice, like a deep (deep) sleeper type post, I would assume for Wilson. Unfortunately the signing of Amendola (I believe on the same day) appears to cap what Wilson could do in terms of fantasy production. @Dase: Never again with Parker! So I’ve got the 2nd overall pick in our dynasty draft this year. 12 team full ppr. My team as it stand right now. As for how I ended up with the 2nd pick, injuries and other teams defenses putting up 30 when they played me happened. In our league you drop players you don’t plan on keeping and draft rookies or free agents you want in the draft. I’ll probably drop some combo of A. Jones, Cohen, Howard…Who should I take with that #2 pick? Barkley will obviously be gone so it’s between Guice, Jones, Freeman, Penny. Unless you think I should go WR there with Kirk or Ridley? Thoughts appreciated. @Allan: if you are going to go WR I would trade back if possible. I like Kirk a lot this year and I love Calvin Ridley long term. You can also never have too many running backs for trade bait and the volatility of the position. If you stay at #2, I’d take Ronald Jones II. I had my dynasty draft already and i think #2 is a very unlucky spot this year if you can trade down i would definetly do it. I think there a lot of good options in the mid of the 1st round. Can keep 2 players and I have last pick in the first round. I was leaning towards keeping Wentz and Theilen because of the value and then being able to draft best available with the 12th and 13th picks. Michael Thomas probably won’t get back to me if I put him in the draft pool so that would really be the other option in my eyes.